Solutions that can improve your bottom-line. Level Seven implements remanufacturing software solutions to support and improve business operations for organizations across the world. These solutions are designed to support organizations’ core business processes. Level Seven offers software solutions designed specifically for remanufacturers, distributors of remanufactured products, and core suppliers. 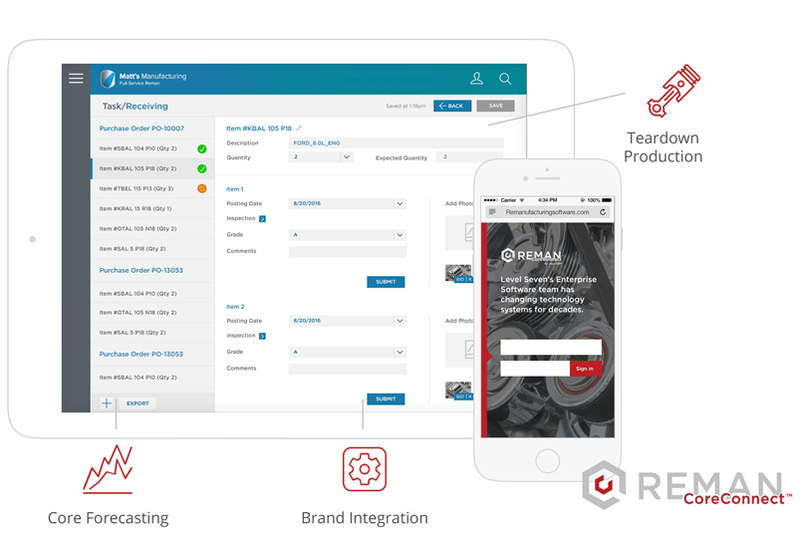 Our RemanCoreConnect™ solution provides remanufacturing features that can integrate with your company’s ERP system to provide the features and benefits that are specifically tailored for the reman industry. Built on industry-leading technology from Microsoft, Level Seven built a remanufacturing solution that scales with growth to deliver long-term value and solutions fully integrated across the entire enterprise. From core management and teardown processes to the challenges surrounding the recovery, supply planning, and utilization of core in your remanufactured products, and everything in between, we’ve built a software solution that allows remanufacturers to serve their customers faster and more efficiently. Training is included in every installation we offer. Read more about our detailed seven-step implementation approach. Agile software development isn’t a set of tools or a single methodology, but a philosophy.